Richard is regarded as one of the best pencil artists in the industry and his superb piece is a perfect example of why. 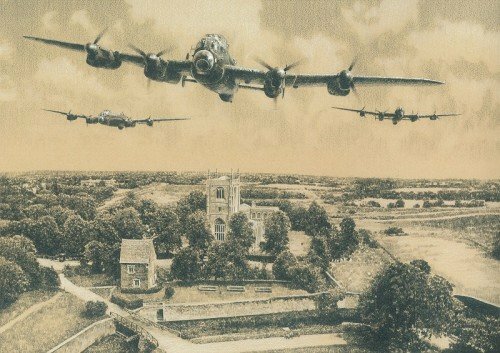 Completed in his trademark technique using a mixture of graphite with colour highlights on antique buff paper, this stunning collectors piece acts as a lasting tribute to the men of RAF Bomber Command. Flight Lieutenant ALAN PAYNE DFC Joining the RAF in 1942, he trained in the UK and South Africa before completing 29 missions as a Bomb Aimer on Lancasters with 630 and 57 Squadrons. Based at RAF East Kirkby he took part in the Battle of Berlin from November 1943, culminating with a raid on Nuremberg at the end of March 1944. He then transferred to Transport Command where he completed a full tour as a Navigator on Halifaxes with 620 Squadron in Palestine supporting the 6th Airborne Division. THE REMARQUE EDITION Few artists of today possess Richard Taylor’s breath taking skills with a pencil but now the artist has lifted the bar even further by introducing subtle coloured highlights into his pencil work. Collectors now have a wonderful opportunity to acquire one of these remarkable 'colour' remarques.